Don was born in Monterey, California and moved to the State of Washington where his family broke ground on a new irrigation project in eastern Washington around Warden. They ran yearling cattle, farmed, and grew potatoes. As soon as Don graduated from high school he headed out to the ION Region looking for a buckaroo job. He tried the ZX in Paisley, Oregon and they were filled up, then on to the MC at Adel, Oregon they too did not need help. Then Don headed for Paradise Valley, Nevada. The Circle A wagon was out and Don contacted Buckaroo Boss Brian Morris and got hired. Don went on to say “While working on the Circle A Wagon, Stub Stanford, from Jordan Valley, Oregon took me under his wing and I began to learn the ways of cattle and buckaroos. I had never worked on a cow/calf outfit which is very different than a yearling outfit like we had at home. It changed my whole life right there. I learned how to work cattle a whole different way, a quiet way. I rode alongside Waddie Mitchel and Claude Dallas and worked pairs out of an “open rodear” The quiet way these men handled cattle and their skills with a rope and horse were something that I will never forget.” Don finished up the branding season at the Circle A, rolled up, and headed back to Warden, Washington where he got married to a Lakota lady from the Cheyenne River Indian Reservation in South Dakota. 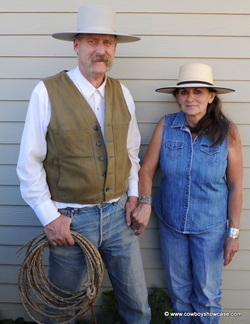 Don and his new wife, Una Howe, headed to Idaho where he got a job in JR Simplot’s feedlot at Burley, Idaho. Don said “In the fall, I went to a saddle-making school in Eugene, Oregon run by Lawrence Dewitt and Ton Henderson.” Before Don left the “Span” he had wanted to buy a Capriola saddle but they were $450 at the time. He never could put his money together, but he did go to “Cap’s” in Elko and picked up a slick-fork tree. 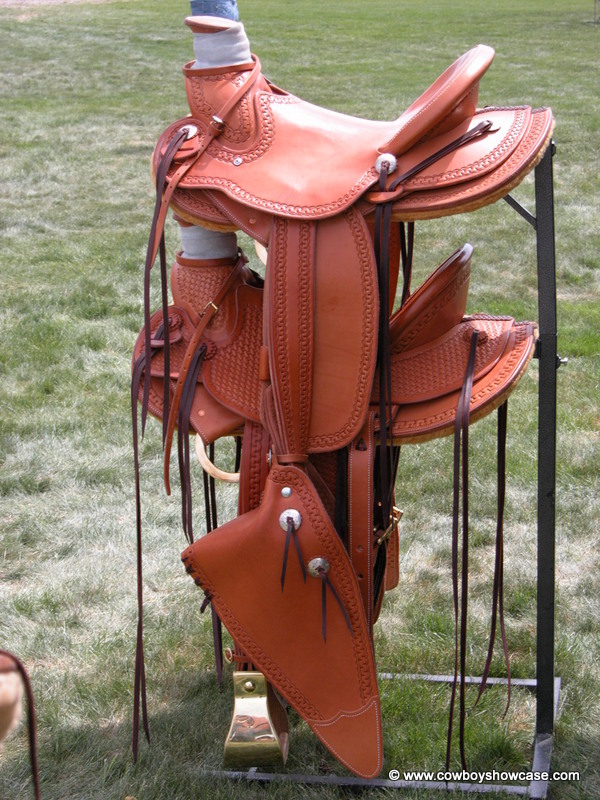 Don Howe had caught the saddle making fever and was hooked for life. 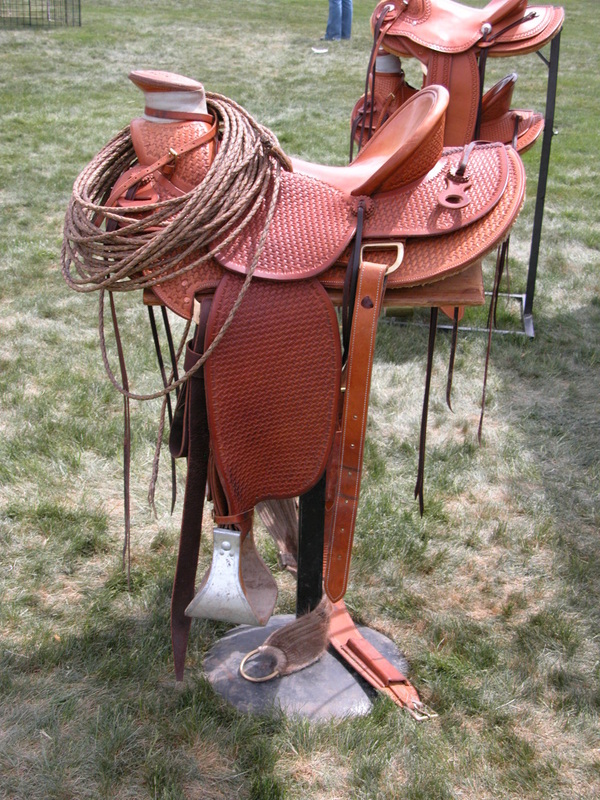 He said, “I made two saddles, one a slick fork from the tree I had purchased at Caps in Elko, and I also made a swell-fork saddle. 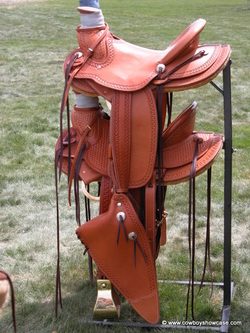 I then went to Othello, Washington and opened up my own saddle shop for about a year. I was called back to teach at the saddle school I had attended in Eugene. I taught there two years. We moved to Dupree, South Dakota on the Cheyenne River Indian Reservation where my wife’s family all lives. 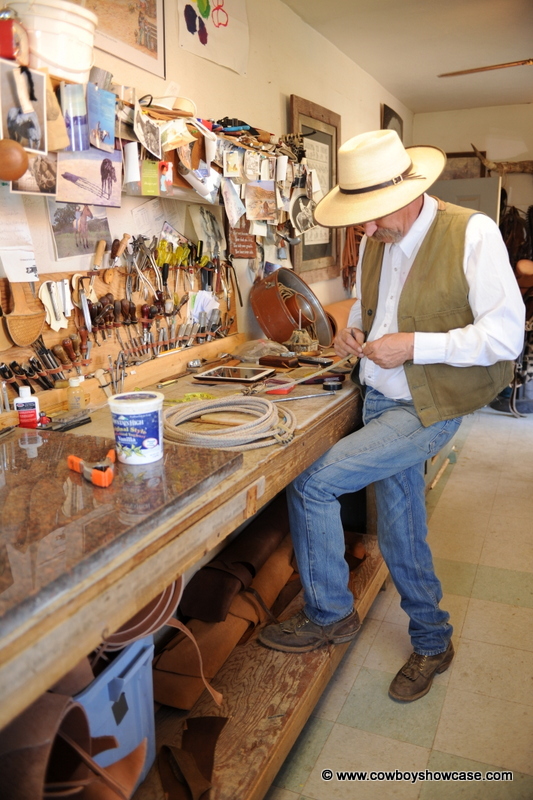 We opened a saddle shop here and have been here since 1992. 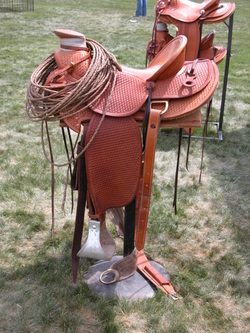 Don’s biggest sellers at many shows are not just saddles but rawhide reatas. Don says, “I have customers all over the world that buy my reatas. I have sold them all over this country from North Carolina to California. I don’t buy any of the rawhide I use, I process my own. I flesh out the cow hides and cut my own strings. You have to have the right kind of hide. I make my reatas out of old “shelly” (thin) cows with very little fat. Red hides are better but I also use a lot of black hides. You can use thinner yearling hides to make lighter gear like reins.